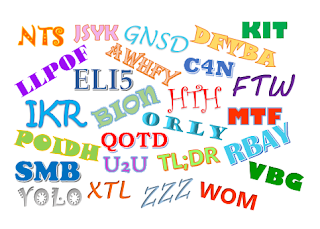 With so many acronyms used on social media, I often feel I need someone to ELI5 (explain like I'm 5 years old) all the different terms and short forms. I understand why we use them; out of necessary (140 character limit), to save time, and just for fun. 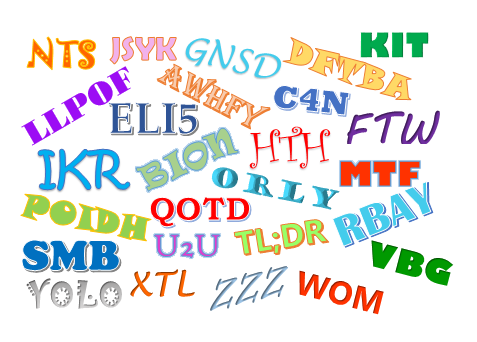 This post is about growing your vocabulary and shrinking it all at the same time. with my absolute favourites highlighted in red. IKR - I know right?! Do you have any favourites I missed? Consider this my work so no NSFW (not safe for work) shares please. 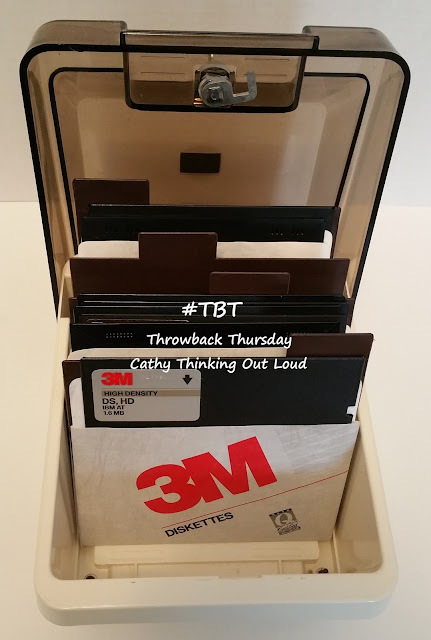 Yep, just me Cathy thinking out loud about some of the IMHO (in my humble opinion) best or more useful SM (social media) acronyms. 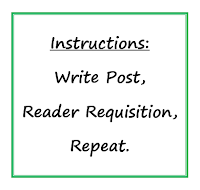 I Write, I Publish, Then the little voice inside my head says "please please please read my post", and then the cycle repeats itself. Yes, I get that it's a wee bit (okay more like infinitely) needy, but I can't help it. OMG ... I just realized I 'm a high maintenance blogger! I have absolutely no idea why one day 100 people visit and another day I'm lucky to get 25 visits, even if I have new posts up and I'm actively sharing links on social media. I just know I like the 100 better than the 25 visits. Maybe on the 25 days you didn't hear my telepathic calls summoning you to a new post. (I'll summon louder in the future). One of my goals for 2016 is post more consistently and increase the number of visitors and length of visits to my blog. My goal for the first half of 2016 is to consistently get 5o+ visitors a day, or 1500 visitors and 4000 page views per month, and double that number for the second half of 2016. Seemed like an achievable goal at the time, but time will tell. Giveaways are fun and increase traffic to the blog, but also skew the numbers since they tend to result in quick one page visit, so I'm not including those in my monthly count. The length of visit is a pretty good indicator whether the post is actually being read. So far I haven't hit my 50 everyday, but I have had other days with more than 50 so over all I am on target to hit my numbers for the month of January. So to all those who have and continue to visit, thank you for taking the time to do so, and please please please keep reading my posts. 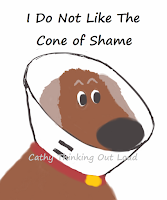 If you're not visiting ... maybe it's you who needs the cone of shame. Yep, just me Cathy thinking out loud about being a insecure and needy blogger. most impressive locking storage container. I guess I didn't have room in my brain to save that information to memory. Yep, just me Cathy thinking out loud about making and saving memories. 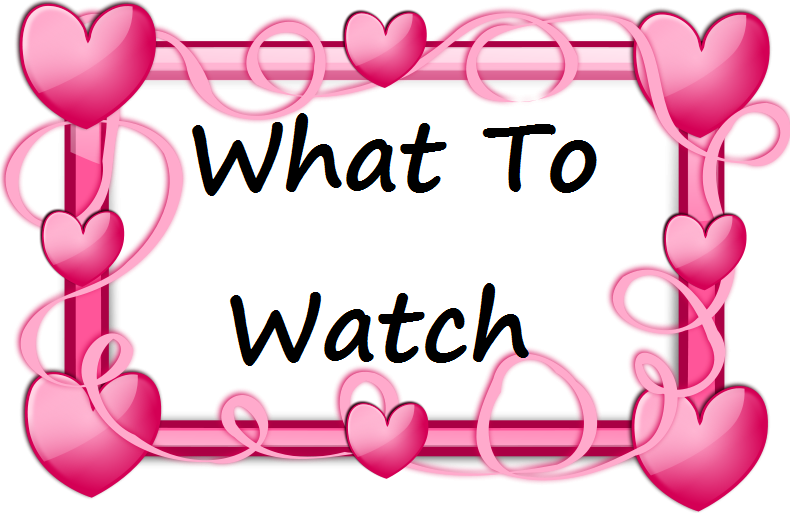 As you all know, "What's Good to Watch?" is a common question amongst my friends and family, and the reason why I share movie and show recommendations on Cathy Thinking Out Loud every Wednesday (aka W2WW). 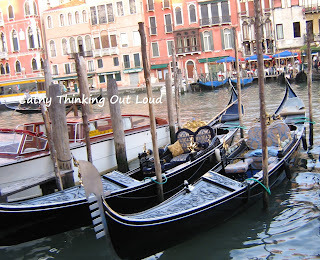 Yesterday was Tuesday and I wrote a #TravelTuesday post about Italy which inspired this week's recommendations of movies set and or shot in Italy. The Italian scenery alone make them worth watching. You can stream them all on Netflix Canada. Sharing is caring, so do tell ... what are you streaming these days? Note: I have not been compensated for this post in any way. All my opinions are my own, and the purpose of this post is merely to share with my readers. These Little Piggies When Mercato Nuovo in Florence Italy. 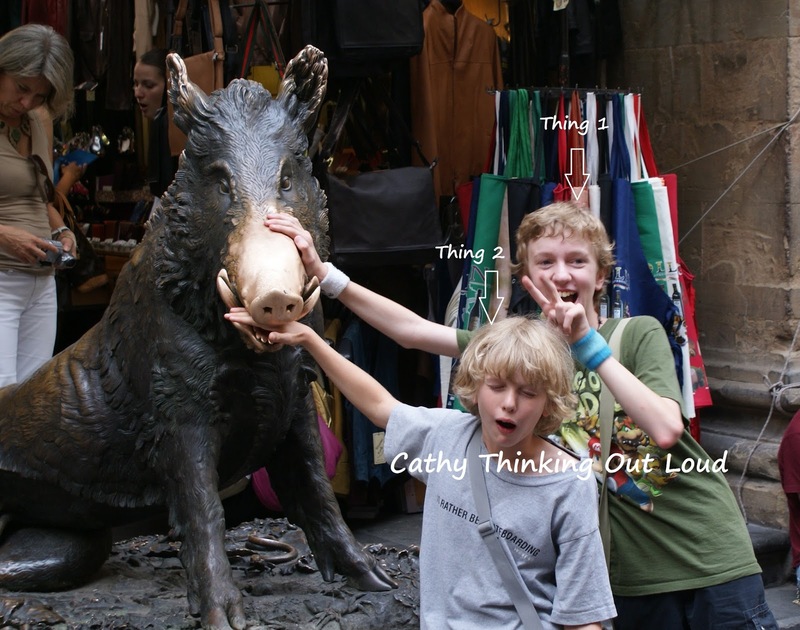 A famous bronze statue of a boar that lives in the Mercato Nuovo in Florence, Italy. This lil piglet and I met at the market 23 years ago while on my honeymoon. The story goes if you rub the boar's snout it will ensure a return to Florence. Indeed I did return to Florence, but on my second visit my own little piglets joined me. Hopefully they too will return to Florence one day (maybe even together). 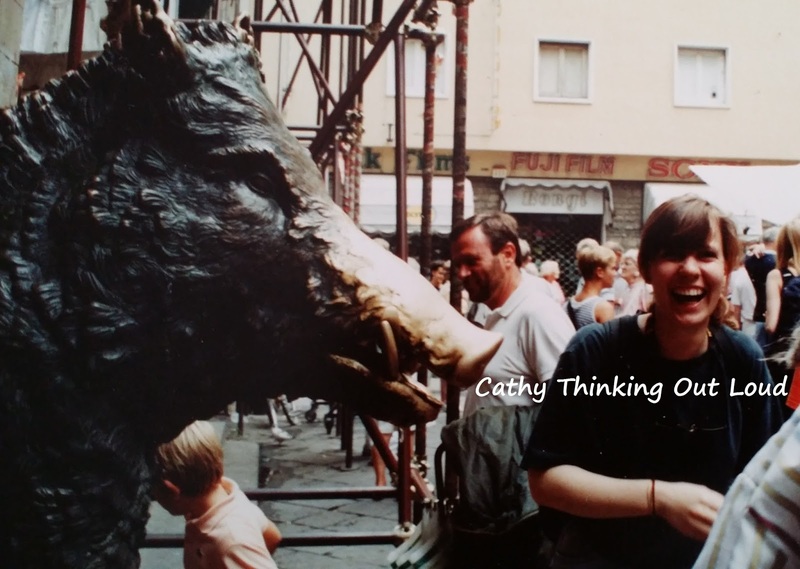 Not only will you find this cool pig featured in many a tourist selfie (or should I say sowfie), but he also has cameos in two Harry Potter movies, and in Hannibal. Florence is a very special destination with tons of history and "must see" attractions, but wouldn't be a neat idea to discover Florence by building an itinerary around the attractions featured in a movie. Maybe on my next visit to Florence I can try this, because there simply must be a return to Florence ... I rubbed Il Portcellino's snout so it's my destiny. Below are a few posts and resources I found on my journeys. I thought they might provide some travel inspiration. What movie locations would you most like to build a travel itinerary around? Please share in the comments section, I love hearing your ideas and feedback. Yep, just me Cathy thinking out loud about travel and another trip to the market. Note: I was not compensated for this post. 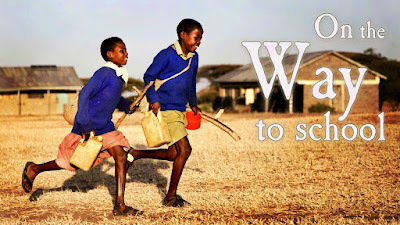 It's purpose is merely to share my experience and travel ideas with my readers. 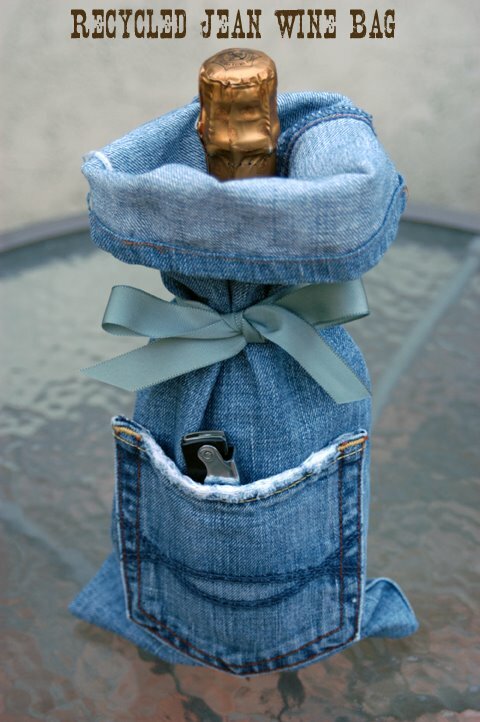 Fast and Easy Ideas to Make Upcycled Wine Bottle Gift Bags! 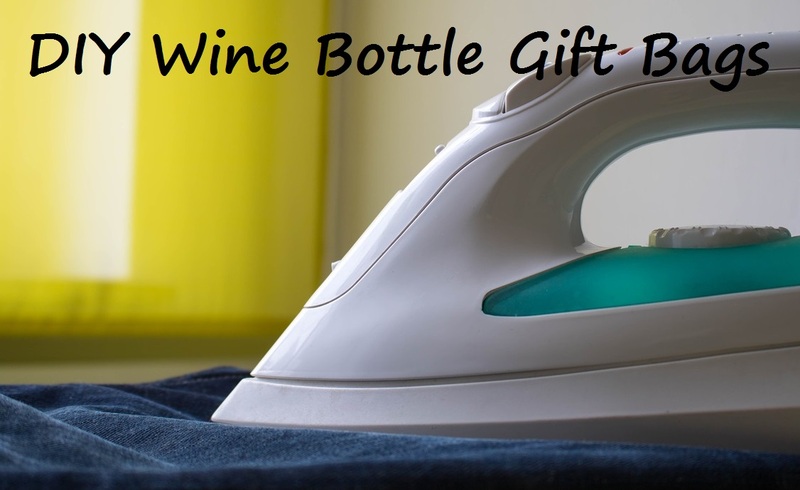 Make fast and fun one of a kind wine bottle gift bags from the sleeves of old sweaters, sweatshirts, jeans and dress shirts. In my opinion the wrapping is as important as what's inside, and these DIY gift bags not only give me a creative outlet, they save me money, and re-purpose items that are damaged or no longer used. I love that they're no or low sew projects, making them perfect for beginner crafters, or recycle-upcycle enthusiasts. The basic steps are the same whether using a shirt, sweatshirt, jeans or sweater. Cut the sleeve/leg long enough to: cover the bottle, plus enough length for the seam at bottom, and for a fold down at the top. The bottom seam can be sewn by machine or hand. Then tie the top with a ribbon, embellish to taste, and Voila! You're done! For detailed instructions see the video and blog links below. For more green ideas look under the blog BEING GREEN tab, or check out my Recycling and Green Ideas Pinterest Board. Yep, just me Cathy thinking out loud about great green gift wrapping ideas. There's plenty to be confused about when it comes to the use of lead, lead and led. It doesn't help that lead has two pronunciations, one of which is the same as led, or that lead can be used as a verb, noun or adjective. So let me "lead" by saying I'm not an expert. I find writing stuff down and breaking ideas and concepts into smaller parts helps me to better understand them. Maybe it might help you too. Lead can be used as a verb, noun or adjective. Noun: Pronounced like Bead or Bed depending on use. Lead (noun) A type of metal or metallic element: Pb is the symbol for Lead on the Periodic Table. Lead (noun) fishing lead or weight (originally made from lead but also called lead): I attached a fishing lead to my line to sink my lure. Lead (noun) term for dog leash: This dog lead is made from leather. Verb: Pronounced like Bead when used as a verb present tense. Lead (verb) to show the route or way, guide or direct: I will lead the group to the conference room. Before we begin, I will lead you through the process. This hall will lead you to the lobby. Lead (verb) at the front, ahead of, first position: She is in the lead to win her school's Spelling Bee. He's currently in the lead for the Innovation Award. Lead: (verb) to begin: I'll like to lead this lecture with a look at the reading materials I've handed out. Adjective: Pronounced like Bead or Bed depending on use. Lead (adjective) to describe principle or main: That is the lead dancer of the ballet company. Who is the team lead for this project. Lead (adjective) to describe an object: Are we using lead pipes instead of plastic pipes for this project? Past tense of the verb lead. Led is always used as past tense. Led (verb) is the past tense of lead - to show the way, guide or direct: I led the team to the conference room. I led the team through the process. We led the dance class with a tango. Tips to Help: Ask yourself: Is the past tense being used? Can you replace the word led with a synonym such as guided or directed and still have it make sense? If the answer is yes to both, then you're probably using led correctly. I led the team to the conference room. I guided the team to the conference room. I directed the team to the conference room. 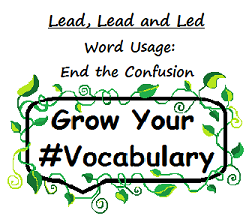 Yep, just me Cathy thinking out loud about Lead, Lead and Led and ways to Grow Your Vocabulary. If I've made any errors in this post please remember I'm not an expert. I'm merely sharing my insights from my efforts to find answers to where, when and how to use lead, lead and led correctly. In other words please be respectful in your comments. Each year my goals and resolutions are the same. The underlying theme is always about persistence, vision, personal growth and positive change. The problem is never the vision, or where I want to go, it's the execution and getting there that's the hard part. Staying motivated over the long game can be challenging, at least for me. One way I motivate myself to take the first step and keep on stepping is by drawing inspiration from other people's stories and journeys. These movies are sure to inspire and motivate you in 2016. 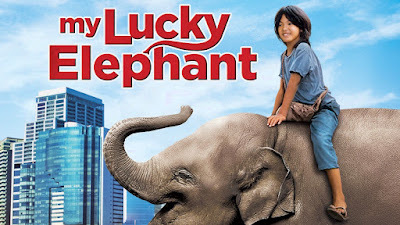 "An orphaned boy befriends an elephant named Lucky. Lucky learns to paint and becomes a famous artist." in a vicious shark attack." daunting challenges as they make their way to school." And just for fun below are another 12 of my favourite movies and documentaries to stream (one a month) throughout 2016 to help renew your determination to reach your personal goals. What or who inspires and motivates you to stay focused and reach your goals. If you have tricks or tips please share in the comments section, I love hearing your feedback. 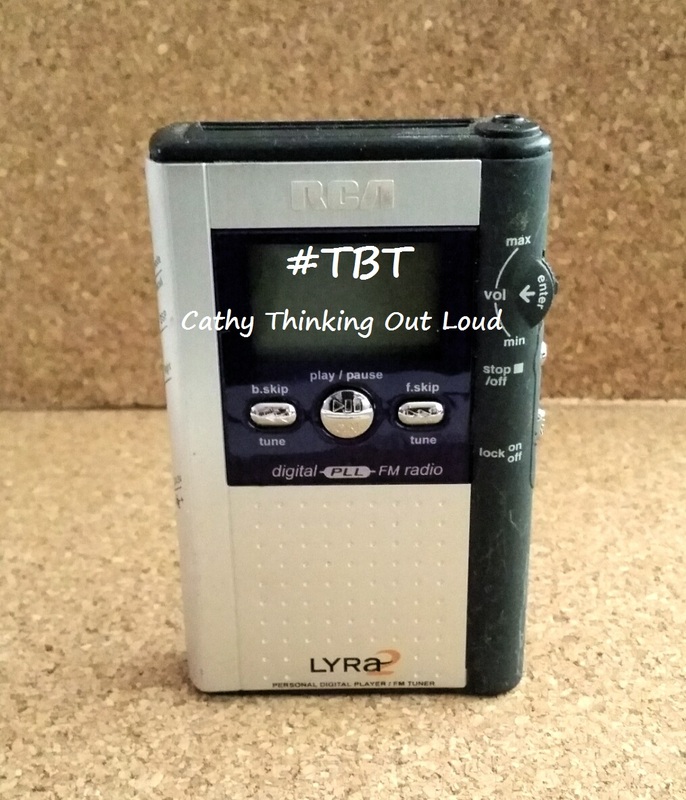 Yep, just me Cathy thinking out loud about an inspired 2016 and a New Year New View. and Netflix Canada on twitter, and facebook. Carrot image courtesy of FreeStockPhotosBiz. 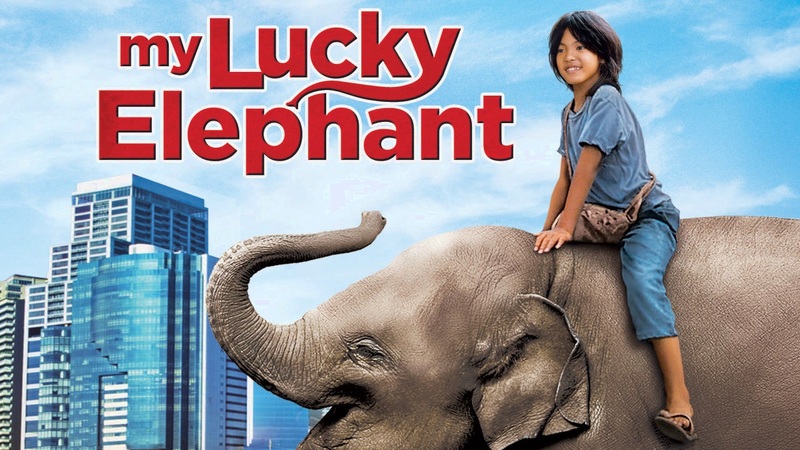 Images for My Lucky Elephant, Soul Surfer and On the Way to School were provided courtesy of Netflix Canada. Parenting Choices: Once You've Made Them How Do You Manage Them? For many years my family did not eat read meat or basically any meat that came from four-legged creatures. This wasn't because of cultural or religious beliefs or even over the treatment of animals (although I do support the ethical treatment of animals). It started with my husband living in England during the beginning of the Mad Cow scare. He cannot donate blood to this day because he spent more than 3 months in England between 1980 and 1996 and is considered to have had possible exposure to the human form of Mad Cow Disease or Variant Creutzfeldt-Jakob disease. I found the book Deadly Feast by Richard Rhodes to be an interesting read and further dampened our desire to eat red meat, so gradually we just stopped. Don't get me wrong, I'm not suggesting in any way that eating beef, lamb, or pork is a bad thing. I'm simply saying we made a choice not to eat them. Around this time we also started to think the fewer people who touched or processed our food the better. I totally understand the appeal of the 100 mile diet, because it allows for so much more knowledge about your food, and knowledge is power. But I digress, this post is not about what food choices I make, or even why to make certain choices, it's about how to manage those choices once you've made them. It took awhile (and many raised eyebrows) for our families to wrap their heads around the fact we did not eat red meat. They debated whether lamb was in fact a red meat, or told us there was only a little bit in the dish, and so on (okay a lot more so ons). We simply said no thank you and ate the items served that did not contain red meat. Eventually they just started to serve meals we could eat as well. The truth is we were only talking about a couple meals a year. Along come kids and we didn't feed them red meat either. Once again we had to justify our decision and endure all the arguments and debates over why other people thought we should eat this or that. With time and repeated instructions not to feed our kids red meat they finally accepted and complied (most of the time). We had no expectations that others fed our kids, but if they did red meat was not to be part of the meal. 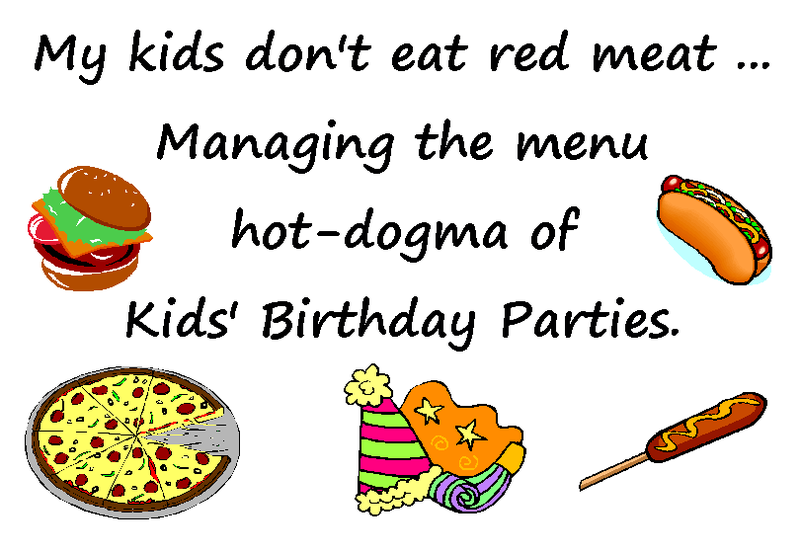 Things were going along nicely until our kids reached the age of "the birthday party" and what I like to refer to as menu hot-dogma where hotdogs, hamburgers, and pepperoni pizza became the foods of choice. I can't say I blame parents, they are easy, convenient, most places that cater kids' birthday parties offer these options, and kids like them. While my kids were toddlers parents were often invited to stay at parties and I could help them with this food quandary. However, once the parties turned to drop-off only my kids needed the tools to manage the situation themselves. In general I found people to be understanding and accepting of allergies as a legitimate reason for food choices, but less understanding or oblivious to religious, cultural, or personal lifestyle choices. Reaction to our decision not to eat red meat ranged from "Aren't they silly, quirky or granola munchers", "She's a hover mother", to outright disagreement. I'd always provided multiple options at my kids' parties, and catered to diet restrictions whatever the reason, but maybe I was more sensitive to this because we had some of our own. 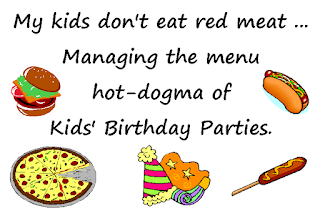 When I RSVP'd to party invites I let the hosting parents know my kids do not eat red meat, not because I had expectations that our personal food choices be accommodated, although I greatly appreciated when someone did so, but so they were aware and not put on the spot at the party. The most common response from parents was "they can just pull the pepperoni off the pizza" (FYI that does not make it meat free) making it clear we needed to teach our kids how to gracefully deal with these situations. We taught our kids to politely and discreetly say no thank you to the hotdogs or hamburgers, or just eat the bun. We taught our kids to smile and just say that is what my parents have decided when adults (more than once) would ask why or try to "discuss" the topic with a 6 or 8 year old at a kid's birthday party. Hint Adults-accept and move on please, and do not share your opinions on my parenting with my kids openly in front of others. Save that for me, I can take it...honest. Plus I have a keen interest to know about your reasons for a few of your choice parenting decisions. We taught our kids it's okay to eat the pizza with the pepperoni pulled off if they are hungry and they want to. We don't serve it at home, but when they are not at home they need to do what seems right for them. We fed our kids before a party so they were not starving if they had to pass on a meal. We made sure they had some cash in their pockets if the party was at a venue with a snack bar. I have no expectations that others should pay for alternative to what they are serving. If appropriate we send a nut-free snack with them to a party, especially if it was a long party. Indirectly we have taught our kids to think about food when deciding what they put into their bodies, whether that included red meat or not, and aim for a good mix of the food groups that will keep them strong and healthy. We taught them not to judge other people's choices, and that each of us has the right to make choices that are right for ourselves. My kids are teens now, and they decide for themselves, if they want to eat red meat or not. We have started to incorporate some red meats back into our diets, and include some of the ones the kids like into what we serve at home. You might ask, what was the point if we are going to let them eat it now? The point was to feed our kids what we felt was the healthiest options we could afford when they were small and growing, and the impact was greatest. The point was to teach our children about the food they eat and that they have choices. Our hope was by showing them the options they would and will make the best and healthiest choices for themselves (at least most of the time); and in general they do. So those of you who make parenting choices that don't always jibe with the majority I hope you stand strong. It sets an example for our kids about making choices and having the confidence to own them, and not feel they need to justify them. 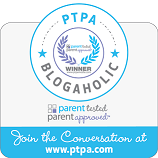 Have you made parenting choices that have been questioned or not considered main stream? How have you taught your child to manage situations that arise from these decisions? Yep, just me Cathy thinking out loud about parenting, and teaching out kids to manage those decisions and makes ones of their own. I wonder what was on my playlist back then? 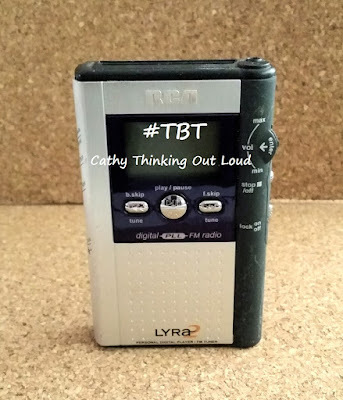 Yep, just me Cathy thinking about beats gone by. Valentine's Day is just around the corner, so to get you in the mood for love, here are 14 romantic movies to stream. You can stream them all on Netflix Canada. Sharing is caring, so do tell, what are you streaming these days? 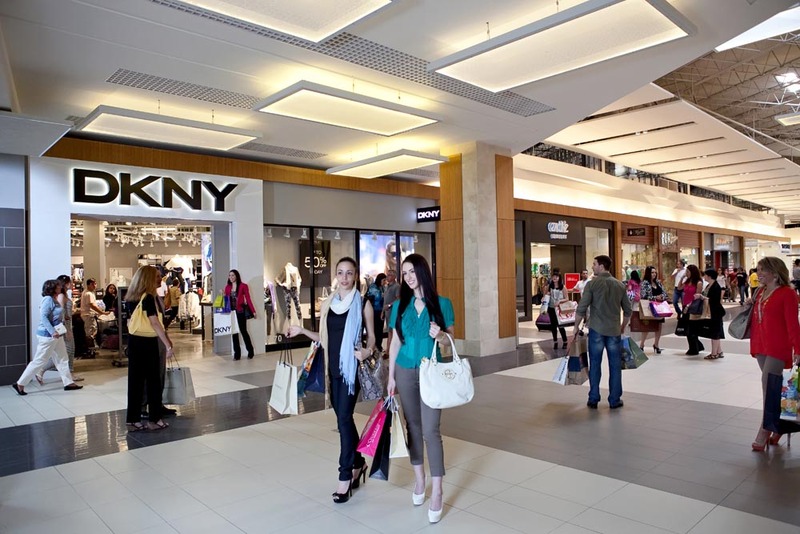 With 350+ Stores it's "the largest value shopping destination in the United States". On a resent trip to Fort Lauderdale I managed to fit in some (lots) retail therapy at Sawgrass Mills. My Mom, Big Sis and I participated in several very productive group retail therapy sessions. Upon hearing about this "huge" outlet mall from my Mom, I thought I would hate it because it was just too big, but turns out I did not. 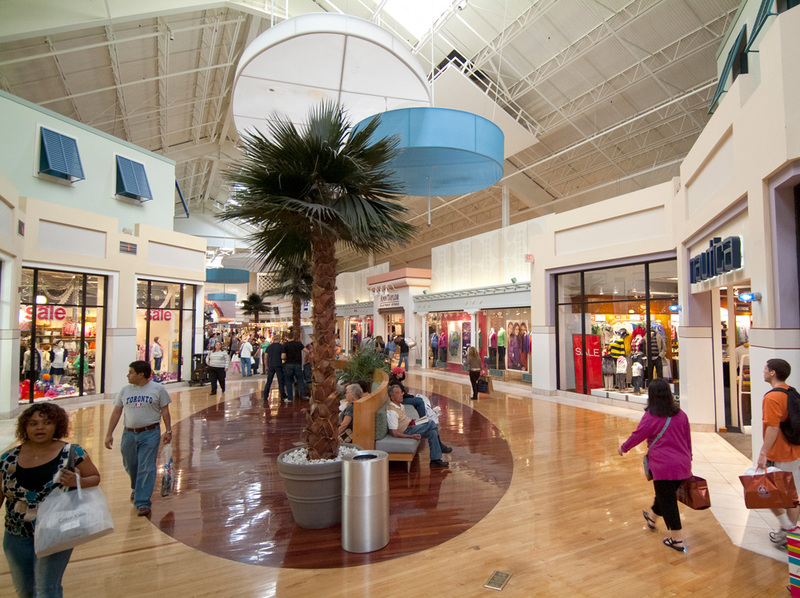 The store and retail selection and variety was great (dah - 350+ stores) but what I really liked was it's largely an indoor mall. If I'm going to cover that much space and spend that much time in one place I don't want to deal with the rain, heat, and the elements. The Colonnade is outdoors. This is a new section of high-end stores, many of which have great window displays for window shopping. "For-Everyone-Stores" like The Gap Outlet, Clark's, Columbia and Nike Factory Store. I managed to pick up a few deals, like Clark's Original Desert Boots, a couple of Coach wristlets, a selection of LeSportsac, a LaCoste watch for Thing 1, and a pair of Converse for Thing 2.
with the help of a Mall Directory Map, a List of Retailers and just a little bit of planning and prioritizing. I also strongly suggest comfortable shoes and a couple folding reusable bags that are easily carried in a pocket of purse. and each of us managed to find several great ones. For example I purchased my desert boots from the Clark's store (Reg $130 US) for $45, and found Thing 1's watch at the Movado Company Store (Reg $255 US) for $68. I also managed to pick up a great tote from Mandarina Duck (Reg $259 US) for $9! at almost every store I visited was outstanding. Special mention to the staff at Chipotles in the food court (friendly, fast & efficient), Movado Company Store (so helpful), Mandarina Duck (totally delightful experience) and the young gentleman at Clark's (what a card). This is a big and busy mall, and the majority of the convenient or close parking spots seemed to be reserved for valet parking. I understand a small portion set aside for valet, but the majority of good spots should reserved for the general public. Let the valets run the 1/4 mile to the boondocks parking spots, since the whole point of valet parking is to have someone else walk so you don't have to. 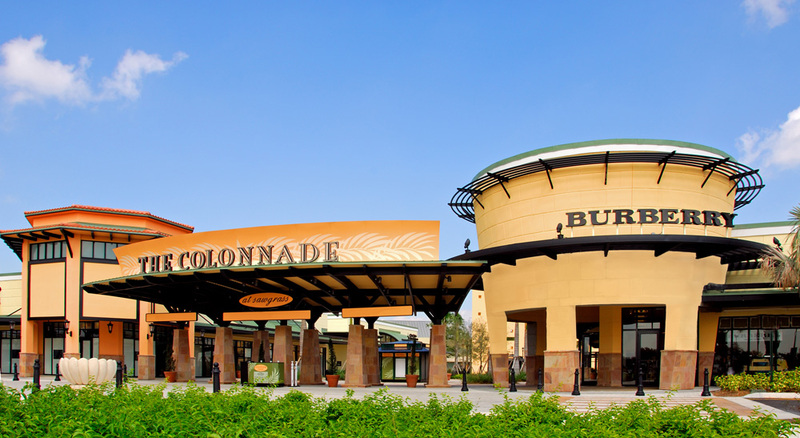 Sawgrass Mills has two Food Courts (one at each end of the Mall) as well as a selection of restaurants. We loved the Chipotle Chicken Burrito Bowls. Near by (0.9 miles) from the mall is Chili's that we ate at several times and liked the food, price point and the service. 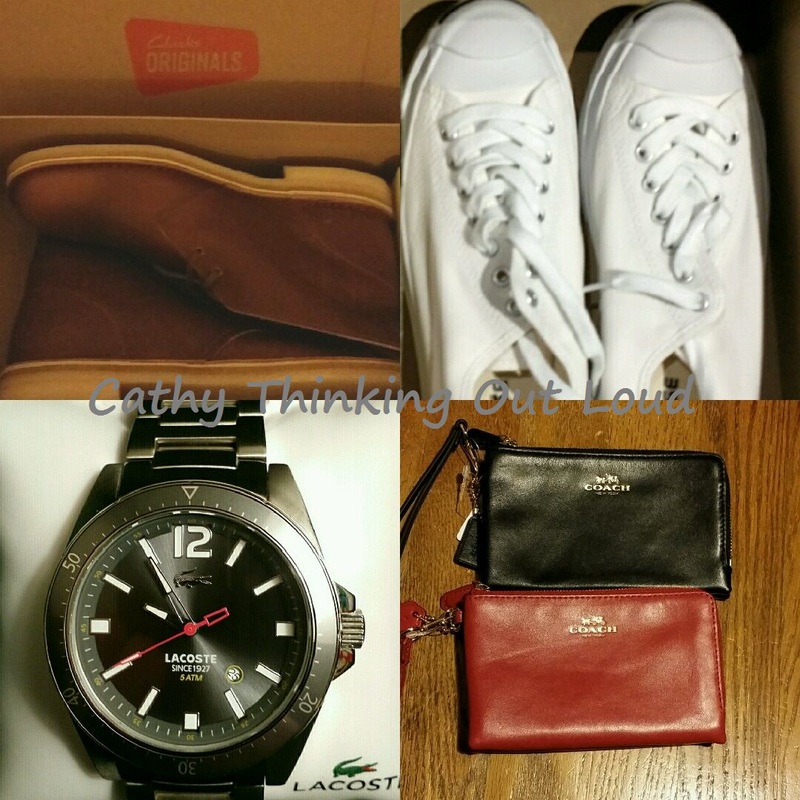 Yep, just me Cathy thinking out loud about retail therapy. Note: I was not compensated for this post. The purpose of this post was merely to share my experience with my readers. All opinions are my own and reflect my personal experience with the brands and products.